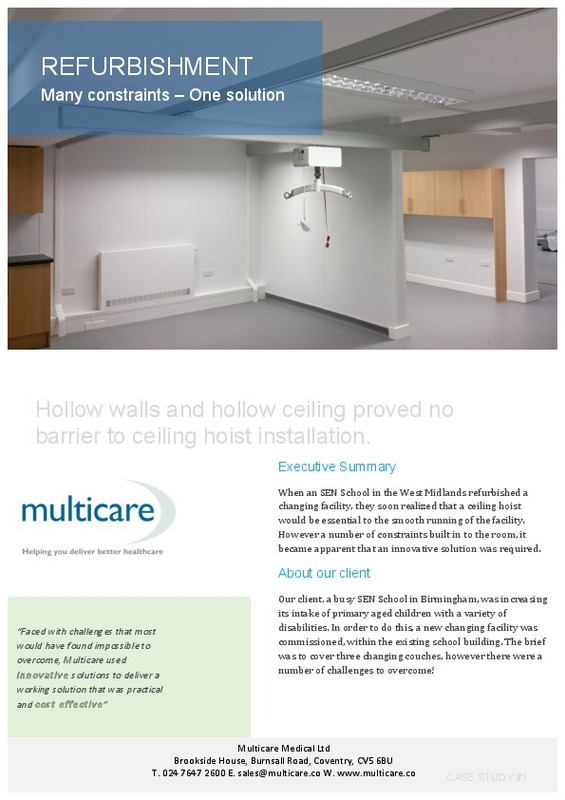 Hollow walls and hollow ceiling proved no barrier to ceiling hoist installation. When an SEN School in the West Midlands refurbished a changing facility, they soon realized that a ceiling hoist would be essential to the smooth running of the facility. However a number of constraints built in to the room, it became apparent that an innovative solution was required. Our client, a busy SEN School in Birmingham, was increasing its intake of primary aged children with a variety of disabilities. In order to do this, a new changing facility was commissioned, within the existing school building. The brief was to cover three changing couches, however there were a number of challenges to overcome! The room selected for the changing area had a low false ceiling, with a non-structural concrete hollow beam roof above. The walls were stud walls, with no structural support and boxing at low level, preventing standard wall posts being used. Additionally a large beam running across the room reduced the working height of the hoist, whilst a sink and storage units in one corner prevented any fixing in that corner of the room. As there was no structural support in the ceiling, we opted for a wall fix hoist, however the stud walls meant that wall posts had to be used. Due to the boxing at low level we specified deep ‘feet’ at floor level to stand out over the boxing and transfer the load to the floor. The sink and storage units in one corner of the room, meant that a fixing point could not be achieved in that corner. Therefore the extra-long track overhang of 600mm was utilised, ensuring that all three changing couches were covered. The compact design of the GH3 meant that even with the low height of the beam, there was sufficient lift height for safe transfer from the changing couches into a wheelchair.